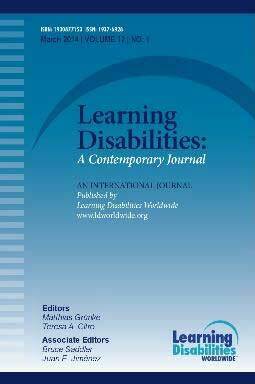 Learning Disabilities: A Contemporary Journal (LDCJ) is one of the leading scientific periodicals in the field of learning disabilities (LD) and related disorders with more than 20,000 subscribers worldwide. Ever since its foundation in 2003, its continuing mission has been to provide research papers of the highest quality that contain well-grounded information on diagnosis, assessment, interventions, policy, and other relevant issues related to academic failure. LDCJ follows a double-blind peer review procedure to ensure fair and anonymous assessment of all submissions. It is published bi-annually in print and online by Learning Disabilities Worldwide (LDW). Indexed in Academic Search Complete, ERIC, PsycINFO, Scopus, and many others.